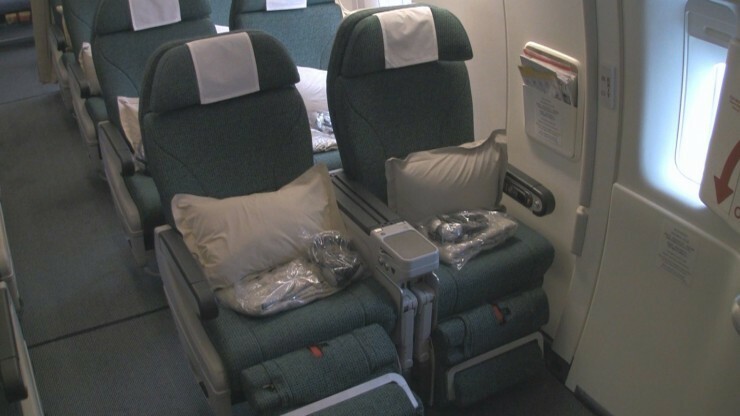 Cathay’s new premium economy cabin adds a fourth layer of service flights between the US and Hong Kong aboard new Boeing 777-300 aircraft for now, expanding to almost 90 aircraft by the end of 2013. The new cabin sits directly in front of economy and behind first and business class. * Dedicated counter at the airport. Little or no queuing involved when checking in. After witnessing the line just before a recent JFK-HKG flight I can attest to this being a huge benefit. Upgraded meal service. 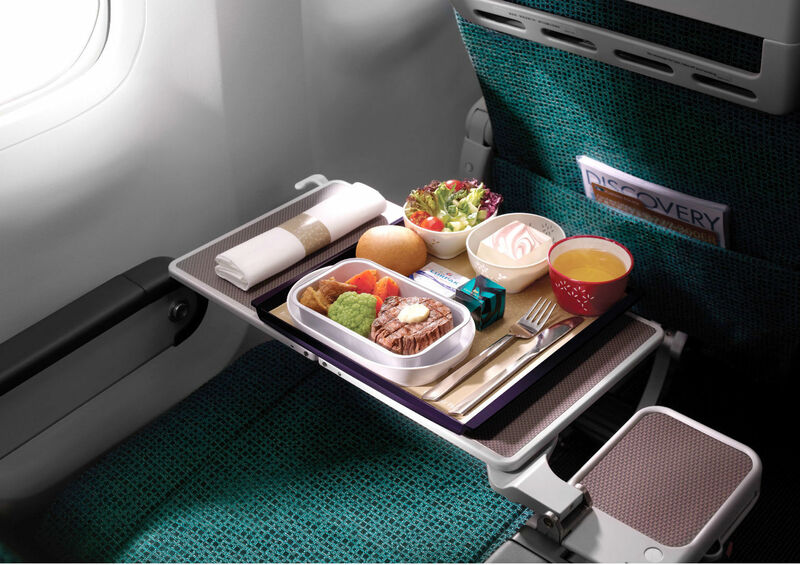 Photo courtesy Cathay Pacific. * 38″ of seat “pitch” the standard used to measure legroom. To compare, that’s 6 inches more than you’ll get in economy. * Your seat is at least 1 inch wider than in economy. Arguably more important is the extra space between seats created by the center console. * A dedicated flight attendant for this smaller cabin with more personalized service. * Amenities and Perks for the flight. A champagne welcome upon boarding, a small amenity kit with the basics, noise cancelling headphones and larger pillows and blankets. * A larger (10.6″) personal tv featuring Cathay’s superb StudioCX entertainment system. There’s also a port for streaming music or video from your own device. Cathay Pacific is pretty excited about it. They’ve even got a rather comprehensive mini-site dedicated to showing off the Premium Economy experience. While prices run from as much as 80% more than economy class, Cathay’s version of premium economy brings much more than you’d get from elevated versions of economy offered by some airlines based in the US and Europe. I’ll be careful and point out that this isn’t a review of the new product, but it looks promising. Along with the new premium cabins, Cathay Pacific is also replacing their seats in economy and that makes us happy. An earlier modhop review warns of achy backs and stiff joints while modhopping over the Pacific. ? Are you sure that’s touch-screen tv? I believe CX does offer AVOD featuring with touch-screen in Y, but not in PE at this time. Cathay Pacific doesn’t offer touch-screen tv in premium economy!!! Thank you again for your correction here and at flyertalk. We have made the correction to the article and are in the process of editing the video for accuracy.